When available, some of these bios have been taken from "Who's Who of The Legion of Super Heroes" and is used without permission. Name: Val Armorr of Earth. Val, named for his mother, Valentina, who died shortly after he was born, was the only son of Kirau Nezumi, a Japanese super-villain also known as the Black Dragon. Japan's "siuper-hero," the Sensei, killed Black Dragon, then promised to raise the villain's son as his own, teaching him not only the martial arts but also an appreciation for more peaceful pastimes such as sculpting and painting. Val grew up in Japan, later moving to Metropolis to join the Legion. He viewed it as a challenge: how to make himself, a non-powered human, into a Legionnaire. By that time, he had established a proficiency in all forms of hand-to-hand combat and hand weaponry, with a special talent for karate. 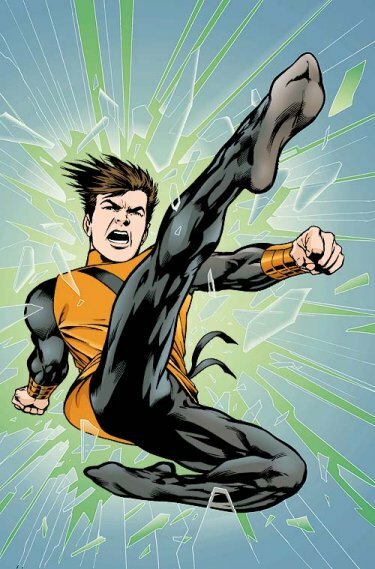 Focusing on this self-created super-karate, he tried out for the Legion on the eve of the Khund invasion and was accepted along with Princess Projectra, Ferro Lad and Nemesis Kid. Successful in his Legion career, he eventually served as leader for one half-year term. He and Projectra fell in love and were married after Val took a trip back to the 20th Century to prove his fortitude to her father. Val and Projectra left the Legion and moved to Orando, staying away from super-heroics until the LSV invaded that world. 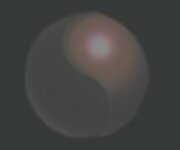 Karate Kid was severely beaten by Nemesis Kid, then died trying to destroy a device the villains had erected to shunt Orando into another dimension. Val learned from childhood every known form of unarmed combat and mastered most of them, making himself a "living weapon" specializing in his self-created "super-karate." He also studied the fighting techniques of every new world he encountered, devising defenses and attacks to use against them. He even adapted several moves for specific use with a Legion flight ring. Despite having no real super-power, he proved his worth by single-handedly fighting foes such as the Fatal Five. He trained many of his fellow Legionnaires in various types of hand-to-hand combat. When Timber Wolf and Sensei traveled to Lythyl as part of the terms of Karate Kid's will, they met the ruling council of Lythyl-- the Three Judges. Myg, the youngest of them and a native of Lythyl, took the two heroes on a tour of the planet in an apparently friendly gesture. While showing them Lythyl's dimensional nexus, he suddenly turned on them, baiting Sensei into a test of skills. The two seemed perfectly matched until Sensei caught Myg off-guard by pausing to compliment the boy-- then knocking him out. Timber Wolf and Sensei smuggled the young judge off the planet. When he awoke and realized that they were no longer on Lythyl, he maintained a curious silence until the three stopped at Karate Kid's memorial on Shanghalla. Awed that a man with similar skills could command such respect even after death, Myg vowed to follow in the path of this Karate Kid, taking the name and asking to be enrolled in the Legion Academy. While Myg's skills need no polishing, his haughty attitude has kept him from becoming a full Legionnaire thus far. While the other Academy students study combat, Myg studies gentler arts such as those practiced by the original Karate Kid, constantly striving to prove himself even better than his predecessor. 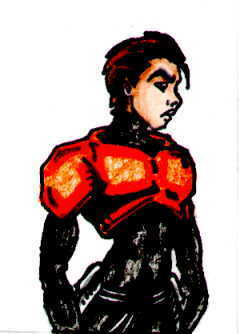 Myg is a master of the martial arts and is especially proficient in the lethal styles. As part of growing up on Lythyl, he learns quickly and can easily make decisions under stress, necessary skills on a world where status was determined by fighting prowess. He has been issued a Legion flight ring under probationary conditions and is learning to apply his talents to teamwork. The SW6 Legionnaires were a duplicate Legion created by the Time Trapper in order to right all the temporal mistakes caused by him previously. SW6 Karate Kid's career was extremely short lived as he and Projectra and Chameleon Boy (both also from the SW6 batch) all died in an explosion relatively recently after their "hatching." Val's mother died in childbirth and he has no idea who his biological father is; he was raised by his sensei. Val was introduced as a member of McCauley's Work Force. Although he viewed McCauley as a petty and ignorant man, he worked for the man in order to fund his travels and broaden his experience and art. Also, as implied in Legionnaires #51, Val believes he owes allegience to McCauley for an as yet un-named reason. However, McCauley's exploitation of the Space Anamoly was the final straw that sent Val off to quit Work Force and join the Legion. Val is shown to be very non-materialistic and concerned with honor. While a member of the Work Force, he never drew a centi-credit for himself beyond his allowance for room and board, and as a Legionnaire, he has refused to claim a room for himself in the headquarters, choosing rather, to sleep in the Legion HQ's botanical gardens. Little has been revealed as yet about Val's past and the nature of his training. He has been shown to possess some historical Karate Kid abilities: in Legionnaires #22 he displays his ability to find the weak spot in anything and destroys the forcefield wall of his prison cell, and in Annual #2 of the same title he is shown to be capable of downing a Daxamite in single combat; an ability that will be further evidenced in LSH #s 111-112 when he has to square off alone against a possessed Thunder and M'Onel. Val's current incarnation seems to be powerless as usual, and seems to be heading in the same general history and skils as the pre-Zero Hour Karate Kid. He utilizes "super-karate" to make himself a worthy Legionnaire. His world is best known for its Oriental feudal culture that is blended with the technology of the 30th Century. He was raised by Sensei Tanaka, who passed on the secrets of his martial arts mastery(his parents were mysteriously killed by the Unseen [an organization of ninjas whispered throughout society, but never proven to exist] when he was still an infant). He is nineteen Earth years old. He is not currently involved romantically with anyone, yet has eyes for Princess Jeka Wynzor(Sensor). Richard learned from childhood every known form of unarmed combat and mastered most of them, making himself a "living weapon" specializing in his self-created "super-karate." He also studied the fighting techniques of every new world he encountered, devising defenses and attacks to use against them. He even adapted several moves for specific use with a Legion flight ring. He trained many of his fellow Legionnaires in various types of hand-to-hand combat.